The World of Althéa: Feat For Talking! That's not "feet for walking", but a new "feat for talking"! OK, my wife thought it was a bad pun as well. 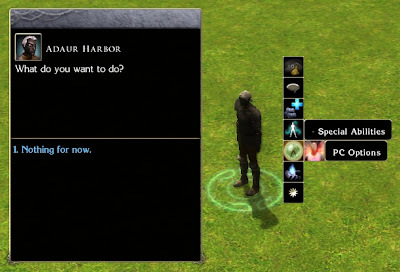 Anyway, today, I have been looking at how custom feats were added to NWN2. In the official campaign, you acquire new "special" feats when you reach the statues at the "Ruins of Arvhan", and so I took my lead by checking out the scripts there. During my dissecting of the code, I learned about changing the colour of text as well. And to top all this, I discovered a new NWN tool that could open and edit both 2da and tlk files for both NWN1 and NWN2. NEW TOOL: The tool I discovered is called TabularFramework and can be found at the Vault. It is quite impressive, and while it takes about a minute to load on the first use, it loads quite quickly on later usage. It not only allows you to edit both 2da and Tlk files, but also has the ability to open more than one file at once and compare 2da files. Also, there is a hexadecimal translator built in that can both decode and assign the confusing hexadecimal codes like the ones used for metamagic at the click of a button! I have found it reasonably stable and can say it has been a very useful addition to my toolset tools. TEXT COLOUR: Text colour is not handled the same way in NWN2 as it was in NWN1, and during my sorting of the feat function I learned how to handle this. It involves a knowledge of the hexadecimal number for a colour, and requires a simple process of assigning the code to a simple string within a constant. I go into more detail on this web page from my website: How To Alter Text Colours. There is a table there showing all the colours and their equivalent name within NWN2 and a brief description of some code that can be used to assign the colour. 1) To make a conversation start in the old NWN1 style (not using cut scene mode), I needed to alter a variable from the conversation properties, which was not obvious the first time around, as the properties is reached by right-clicking on the conversation file name and opening a new properties window, and not from within the conversation itself. 2) There is a column in the feat.2da that says, "IsPersistent". I thought this was to do with allowing a feat to work across a campaign, but it turned out to be with activating the feat every time the player entered a new area or the module loaded. This meant my PC Options conversation was firing every time I started the module, which I did not want. My thanks got to Kaedrin for helping me find this out. Die! Die! Die! And Stay Dead!